MAxes TM systems provide variable magnetic field on the three principal axes and are particularly useful for orientation studies on a variety of samples. The system is comprised of a 2 or 3-axis superconducting magnet, low helium consumption current leads, magnet dewar and other associated electronics. Typical specifications include magnetic fields up to 9T for the principal vertical axis, 2.0/3.0 inch vertical clear bore and up to 3T rotating vector using any combination of x, y and z-axis magnets. It is possible to use the magnet system with existing sample inserts or AMI can provide a variable temperature insert which operates from 1.5K to 300K. Our users have also used such systems with 3rd party He3 systems and dilution refrigerators. The MAxes TM system provides a unique way to rotate the magnetic field vector on the three principal axes and this has proved useful in performing anisotropic studies on a variety of materials. MAxes TM systems have also been very useful in advancing research in the areas of spin based physics. The magnet system software provides automatic sequencing of power supply currents and thus magnetic fields that allow the user to specify and control the magnetic field vector from a single computer screen (below). The interface allows the user to enter the desired field vector of a 3-axis magnet in Cartesian, cylindrical, or spherical coordinates. 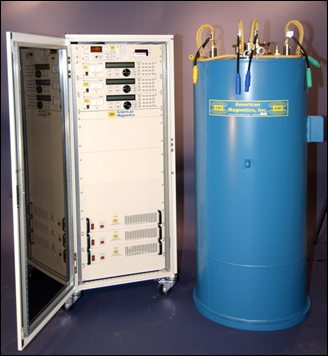 Cryogen Free (CF- MAxes TM ) and Optical Access (Opti-MAxes TM ) systems are also available. Customers are finding the combination of a Dilution Refrigerator with a MAxes TM system useful in the study of Quantum Mechanics and other nanoscale studies. The attached link is to one such site: Del Barco Group Research.